Viking Dredge is a specialized version of Viking Navigation, it introduces added functionality such as 3D DTM dredging area support and suction pipe/dredging tool interfacing. Viking Dredge can be used on virtually any type of dredger, be it a large trailing suction hopper dredger, a small cutter dredger or an hydraulic excavator. Viking Dredge can operate as a standalone solution, directly connected to a DGPS receiver and a multitude of dredging sensors. In addition it is also possible to connect the Viking Dredge Pro version to a STPM installation thereby offering a fully featured dredging system. An important fact of Viking Dredge is that it is very easy to use and to work with. 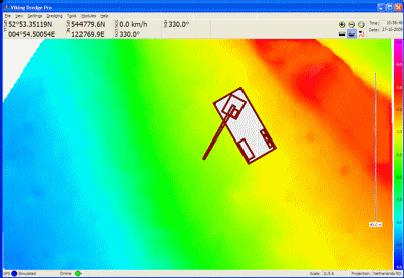 The interface is divided into logical sections all of which have clearly visible dredging values. Only the necessary tools and buttons are displayed on the screen, offering a clean and easy to use interface. Viking Dredge can be used for virtually every type of dredging equipment or dredging vessel. Viking Dredge is available in two separate versions, this way a cost effective and easy to use system can be installed, conforming to the type of dredging vessel used. The basic version is simply called Viking Dredge, and includes all necessary functions for a typical dredger. 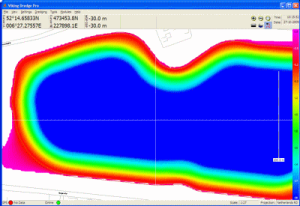 It includes 3D DTM dredging area support, interfacing with all types of dredging equipment, XYZ & DXF file support and real-time updating of the DTM model. 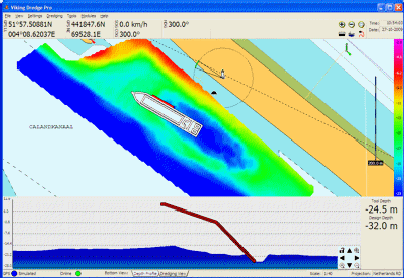 The full version called Viking Dredge Pro, supports all the features of Viking Dredge, but is extended with all navigation features found in Viking Navigation. Such features are, for example Modules support, Navionics & C-Map charts, extended navigation routines and interfacing with other products we offer, such as the STPM and TDS systems. 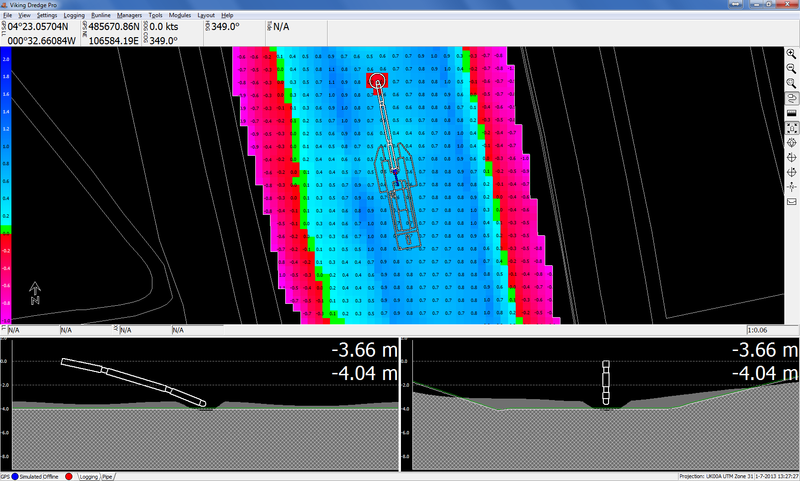 Viking Dredge Pro has the added ability to interface with our STPM (Suction Tube Positioning Monitoring) software. 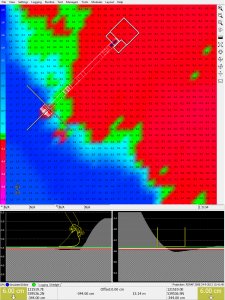 By doing so the STPM system will handle all dredging sensor interfacing whilst displaying all information as a stand-alone system, simultaneously STPM will forward the suction tube data to Viking. 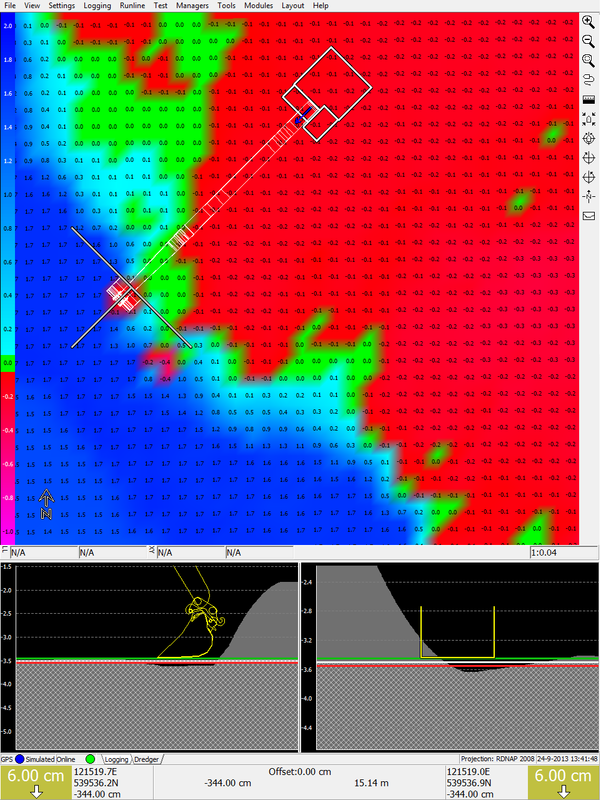 Based on this data Viking can display the exact position and depth of the suction tube along with position of the dredging vessel itself. The STPM interfacing also applies on hopper dredging vessels fitted with two suction tubes. Both STPM systems will interface with the Viking system on board and thus offering a total solution for larger dredging vessels. 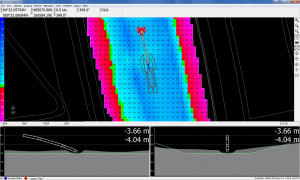 It is possible to position two different 3D models in one DTM area. This enables Viking to calculate and display the difference in height and volume between a theoretical design matrix, and a work matrix based on a hydrographic survey. As the work matrix is updated in real-time both depth and volume values are updated accordingly.